Animations and simulations are frequently used to teach concepts of chemistry, especially at the submicroscopic level. They often help students visualize the processes occurring among the species, but students may not necessarily change their mental models, after viewing them. In order to elicit their understandings, it may be suggested to allow students not only to passively view but also to critique the animations. With adopting the variation theory, this study aimed to investigate how preservice chemistry teachers make sense of two dynamic submicroscopic redox animations that are conceptually in conflict with each other by critiquing and reflecting on their particular features. Twenty-two preservice chemistry teachers first viewed an experimental video of a redox reaction between zinc metal and copper(II) sulfate solution. Then, they represented this redox reaction at the submicroscopic level. These representations, revealing their mental models, were coded and analyzed to identify the level of their conceptual understanding. Then, they viewed two submicroscopic animations; one of them was showing a scientific representation, and the other included a common alternative conception. After viewing these animations, the participants wrote reflections by critiquing them. One week later, they were interviewed to obtain further information about their understandings. 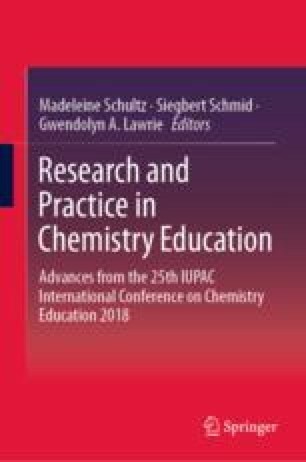 Findings from the analysis of reflective writings and interviews suggested that preservice chemistry teachers’ initial mental models affected the aspects they highlighted in their representations. The participant with a scientific understanding (1 of 22) was able to identify the scientifically accurate animation as accurate. About two-third of the participants with a moderate, a weak and an alternative understanding (13 of 21) identified the scientifically accurate animation as accurate; whereas about one-third of the same group of participants (7 of 21) did not clearly indicate their views about the scientifically accurate animation but they only described its particular features without referring to its accuracy. In general, the majority of participants experienced a challenge with making connections between macroscopic and submicroscopic features. This study was co-funded by The Scientific and Technological Research Council of Turkey (TUBITAK), Grant Number: 115K025, and National Science Foundation (NSF), Grant Number: 1525557. We would like to thank our collaborators Prof. Resa Kelly, Dr. Sarah Hansen and Dr. Adrian Villalta-Cerdas, and the project assistant Gözde Yıldırım, for their contribution and inspiration. Akaygun, S., Adadan, E., & Kelly, R. (2019). Capturing preservice chemistry teachers’ visual representations of redox reactions through storyboards. Israel Journal of Chemistry. https://doi.org/10.1002/ijch.201800133.